A portrait of a seated woman holding a pipe with ripening maize plants in a section of garden behind. Around her neck are a variety of bead and metal chain ornaments. She is described simply as an unmarried girl. Note on print reverse ms ink - "unmarried girl"
Morton, Chris. 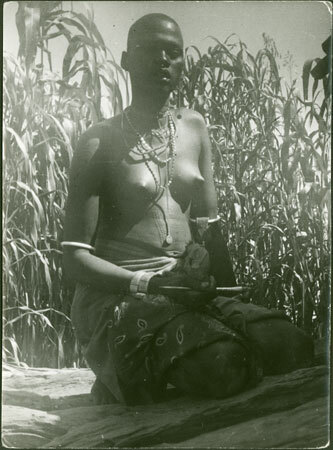 "Mandari woman " Southern Sudan Project (in development). 03 Jan. 2006. Pitt Rivers Museum. <http://southernsudan.prm.ox.ac.uk/details/1998.97.33/>.